All right, I know that yesterday was April Fool’s day, and we sure as heck covered our fair share of crazy gizmos that will never see the light of day (or will they? We shudder at the thought), so while we are in full swing where April 2nd is concerned, here is my last take for April Fool’s this year – with the $299.99 Eye of Sauron Desk Lamp, of course. This is one idea that would definitely score points with fanboys should it be released to the masses, but unfortunately, as of right now, it will remain within the figments of one’s imagination, just like the fantasy storyline that the building itself is based on. 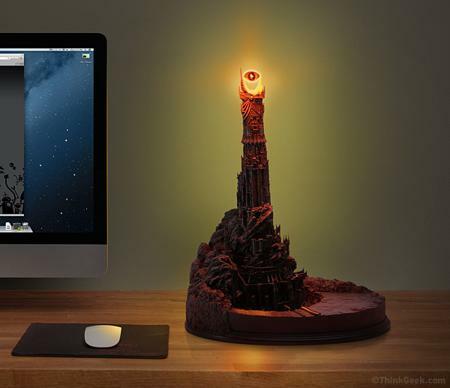 The Eye of Sauron Desk Lamp is touted to be an exact model of Barad-dûr, the Fortress of Sauron, where it has been expertly recreated from the movie, all the way down to the finest detail. The roving eye will continue to make sure you give your best at work, and this thing, without an eyelid, sure as heck is creepy! No way Incognito mode on your Chrome browser is going to let you off the hook now when it comes to visiting questionable websites while you are at work. It would even be cooler if it could give random quotes of *I see you!” when you least expect it. Imagine working late on the computer at midnight and suddenly you hear Sauron speak. I almost got my hearts set on it but it’s an April Fools joke! I feel like sicking the Orcs on them!